Economics is a huge topic, so Cryptoeconomics is not any different. Cryptoeconomics can be divided into the many concepts, theories and classifications. Cryptoeconomics sounds complicated, but I will prove to you that it is not. 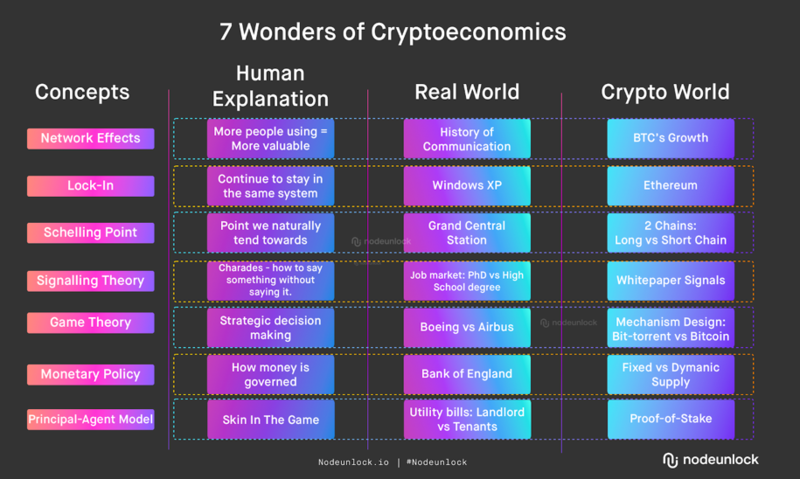 In this article, I share the 7 wonders of economics concepts, the explanation, real world example and crypto example. I am basically taking existing economic concepts in the physical real world to the digital crypto world. Hopefully, that inspires you to understand the power of economics in blockchain, and inspire you to learn more. Note: this is not an exhaustive list of economic concepts. I just chose 7, because it makes a nice title! You hear people talking about network effects all the time, especially at conferences by economists or people in the space. What’s that? Basically, the more people using the thing, the more valuable the thing is. Example in real world: classic example is telephones. But it’s 2018, so we are not using that example. Look at WhatsApp. You can only text someone if they have the app. The app becomes more valuable (to me) as more people join. Now, I can text my international friends with WhatsApp because they have the app. On the other hand, my grandmother doesn’t have WhatsApp, so it’s not possible for me to text her. WhatsApp is more valuable (to the users) as more people use it. Other communication apps: Blackberry Messenger, KakoTalk, Line, WeChat, WhatsApp, Facebook Messenger, iMessage. Note: there is a geographical network effect in the different types of communication apps! Example in crypto world: Pizza costs 10,000BTC in the past. Today, it’s a fraction of 1BTC. What changed? Many people are using BTC, joining the network, accepting/using BTC. In the past, BTC was not accepted by many merchants. Once you receive BTC, you need to know how to spend it and convert it back to usable fiat. It was not very valuable (to the user in early days). Today, many companies accept BTC. Some people get their salary in BTC too! The value has risen, as a result of more people using it. Lock-in is a relatively new concept compared to the rest of economics. This came with the evolution of information and technology, where we created information economics. Example in real world: Did you know, 8% of the world is still using WindowsXP? Why does that happen, when there are better systems that Microsoft created? Simple, it is expansive to upgrade to Windows 10. Imagine how much it would cost to get the Windows 10 licensing fee for 100 people in your business. There are also other things like the enterprise system being built on WindowsXP, there is no real need to change the system to Windows 10 and other knowledge specific to the OS. Schelling Point is a phrase people enjoy throwing around. It’s created by this economist, Thomas Schelling. It is used commonly in game theory. What’s that? With zero communication, it is the natural focal point people tend towards. Here are 4 numbers. Which number will you choose? 584376, 230873, 10000, 238176. Probably “10000” because it is a natural comfortable number people tend towards. Example in real world: If I say we are all going to meet at New York’s train station at 12pm, which train station comes to your mind? Probably Grand Central Station. Or, you are in a new country and you don’t speak that language. There are 2 restaurants there, 1 with a long queue and 1 with zero people inside. Which restaurant will you choose? Most probably the longer queue. Example in crypto world: Similarly, imagine you are a miner. You have a block and you can add to either LongChain or ShortChain. You’ll naturally tend towards the LongChain. Same idea. This is quite common with marketing websites. What’s that? Signaling theory is like playing a game of charades. You have the let the other person guess your card without saying the words. Example in real world: You want to show your future employer that you are smart and capable for the job. What do you do? Probably get a good degree in a good university and be the leader in student unions, etc. You can signal your traits through actions and activities. Example in crypto world: You can pay money for your company to be published on CCN, Forbes, Hackernoon, etc. They are signals to the public that your company is so innovative, these big publishers are interested to report on them. That’s how you can win trust of the public. Arguably, the most talked about issue when it comes to economics of tokenisation. What’s that? Looking at all the options and possible consequences of taking those actions, what will your choice be. It is about analysing a situation, to predict the next move. Example in real world: Airbus and Boeing are the 2 airplanes manufacturer (duopoly). In the last 90s, they wanted to create a superjumbo jet. They came into the agreement to develop it together (half the cost of expenses), but Boeing kept delaying it. Why? We can use game theory to analyse why. Boeing is in the lead for producing aircrafts then. They also have the largest planes then. If this is successful, Boeing has to share the success with Airbus. That also means they are no longer the company with the largest plane. Current situation: leader in industry (more than half of industry). Possible future situation: either superjumbo jet fails (lose all investment) or share the market with Airbus (half of the industry). Naturally, you can see that Boeing should not develop this superjumbo jet. In fact, they should delay the development of it. AND THAT IS WHAT THEY DID! In the end, Airbus had to develop the superjumbo jet on its own (super expensive & takes a longer time). Example in crypto world: We look at bitcoin vs bit-torrent. They are both peer-2-peer in nature, and require nodes to be on the platform. Yet, bitcoin succeeded where bit-torrent failed – incentives to stay in the system. In Bitcoin’s case, nodes are incentivised to stay on the system as they can earn block rewards (current incentive) AND transaction fees (future incentive). Bit-torrent, however, does not have such incentive mechanism to encourage participants to stay on the network. Bit-torrent situation: stay or leave the network (nothing happens). Bitcoin situation: stay on the network (rewarded with block reward & transaction fees), leave the network (nothing happens). Naturally, people want to stay on the network in Bitcoin to earn some BTC. This is applicable to currencies (e.g. regular cryptocurrencies and stable coins). What’s that? Monetary economics is how money is managed and governed. Example in crypto world: The difference is that it is mostly decentralised. That means, main decisions are embedded in code and baked into the crypto-project. Depending on the mechanism design, people in the network can vote to change certain system. It gives more power to the people. In crypto world, we have different ideas for the supply of token/digital money. Some like it capped, some like it uncapped. BTC has a cap at 21 million, while others don’t, like MakerDao. This model is a lot more complicated, but the idea is simple. What’s that? Skin in the game. To motivate a behaviour, the most direct way is for the person to have skin in the game. It’s like placing a bet against yourself. You’ll definitely do the best you can, to benefit yourself. Example in real world: If your water bills is included in your rent, you’re likely to waste water and have a bath every day. But if you have to pay utilities based on what you use, you’re gonna take a shower once every 4 days. You’ve got skin in the game! Example in crypto world: Proof-of-stake is a validation mechanism. Basically, if you want to validate a block, add your name + some money into the pot. Then, it’s like a lucky draw, and they will pick a name from the pot. That person gets to validate. Now, if I have to stake money to validate a block, do you think I will validate a “bad block” and risk MY money? No, because I will only do things that will benefit me. This is a way to enhance skin in the game!